This just might be the most exciting purple hued webpage you read all day. Possibly ever. Because no other website is going to tell you about Carolina Cash 5 – North Carolina's rolling jackpot game that gives you a chance to win every night of the week. Monday night? Yep. Tuesday night? Darn right. Wednesday night through Sunday night? Heck yeah. For just $1, you get a shot at jackpots that start at $100,000 cash money and keep on climbing until somebody wins it all. And speaking of winning, there are four ways to win. Want more? Add EZ Match for $1 a play and you could win up to $500 instantly. A draw game with an instant-win feature? The only thing better than that would be a jackpot with your name on it (which – unfortunately – we can't guarantee). But if you've been looking for the jackpot game with the best odds, we can guarantee that you've found it. Meet Carolina Cash 5, y'all. Pick five numbers from 1 to 43. Each Cash 5 play is $1 (add EZ Match for $1). Select Multidraw to enter up to 28 consecutive drawings. The Cash 5 top prize is won by matching all five white balls, in any order. You can win up to 5 more times by instantly matching any EZ Match numbers. *Pari-mutuel: Payout method that splits the total available prize money for a particular prize level between all winners of that prize level. A 4-match is subject to the NCEL Games rules and may become pari-mutuel under certain conditions. **The advertised top prize is an estimate and is paid in accordance with NCEL game rules. Can be added to any Cash 5 ticket for just $1. 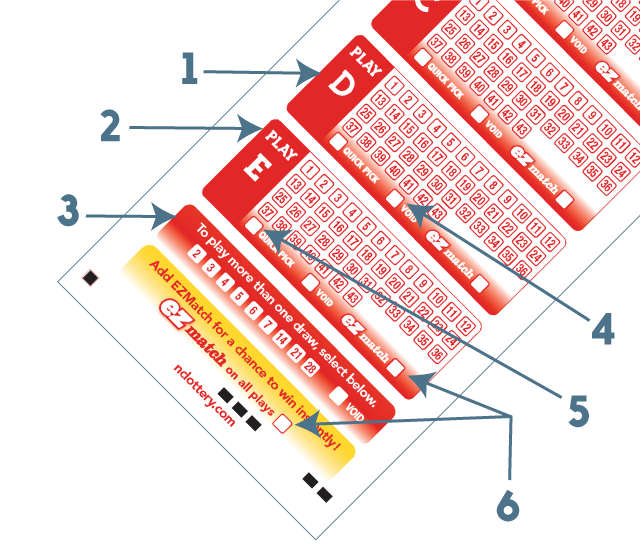 The terminal provides a ticket with five EZ Match numbers for you at the time of purchase. 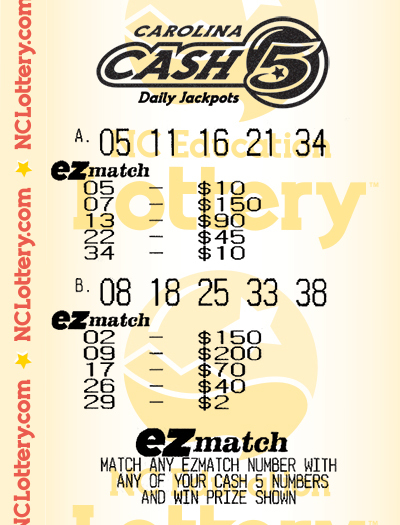 Win up to $500 instantly if any of the EZ Match and Cash 5 numbers match. Play area A: Two EZ Match numbers match two of the Cash 5 numbers. Each match in the example shows a $10 instant prize, for a total instant prize amount of $20 for that play. Play area B: None of the EZ Match numbers match any of the Cash 5 numbers, so no instant prize is won. Cash 5 sales end at 10:59 p.m. nightly and resume after the drawing. Tune in to your official lottery drawing station every night at approximately 11:22 p.m. to see the winning numbers drawn live.